A few things to note. Like ASPX, we have a tag syntax: "<# .. #>". The "@" indicates directives that control the templating process. (Directives are documented here.) We will come back to these in a bit. For now, note the "language" directive that indicates the language you will use to generate templates (C#), and the output directive that controls the extension of the output. We can easily add some C# logic by including it in "<# ... #>" tags. For example, let's loop through some values. The highlighted text is executed as code, and the nested text is emitted from the loop. To show how this can be adopted to C# code generation, lets make a few changes to generate a constants class from a text file. First, lets change the output type to ".cs". Now the emitted code will be a class file, and will automatically be included in the solution. Now, lets add a text file to the solution called "Constants.txt". To simplify things, lets treat this as a comma delimited file with this format: name, type, value. // Creates a constants class based on Constants.txt. // This is generated code. Edit Constants.txt to add values. This file will be regenerated when ever the template is modified, or when you select "Transform all T4 templates" from the build menu. And there you have it. Code generation in five minutes! The fact that this is all built on top of C# is a real plus, in my view, as is the seamless integration into Visual Studio. The only pain point is the lack of syntax highlighting and intellisense, though there are a number of 3rd party plugins that do this, for example: this and this.) Of course, this example is not production ready, but there is clearly an opportunity here to automate boiler plate code. I'd be curious to here in the comments if and how you are using this technology. I think I'm having the same issue as you. 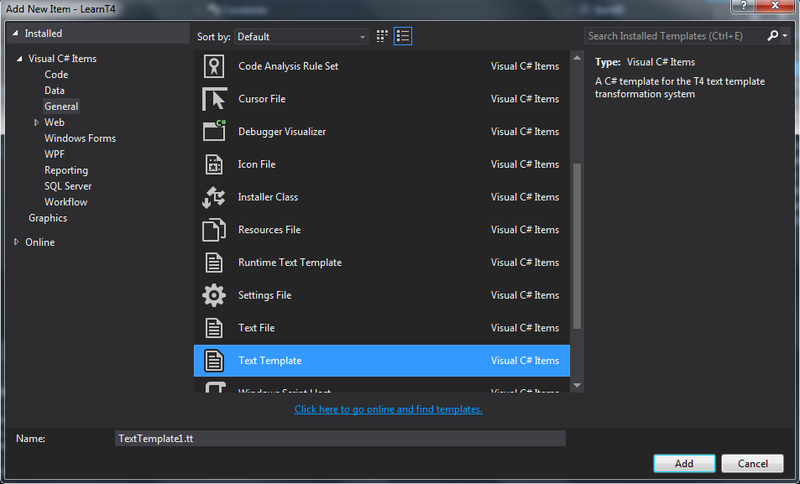 I'm trying to use the TDS out of the box T4 templates to use generate my classes that are Solr compatible. But the fields are missing the postfix annotation. do you have the T4 templates that actually work?